Assessing the English Language proficiency of Qaiwan University new students. Malaysian Lecturers reporting for duty at Qaiwan University. 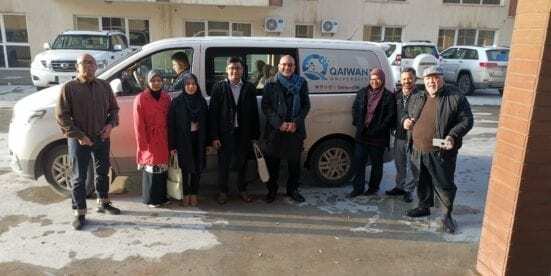 KURDISTAN, IRAQ, 13 February 2019: Two members of Language Academy (LA), Faculty of Social Sciences and Humanities, Universiti Teknologi Malaysia (UTM), Mr. Ghazali Bin Bunari and Ms. Awis Rumaisya binti Azizan were sent to Qaiwan University (QU) in Sulaymaniyah, Kurdistan, Iraq from 5 to 10 February 2019. Upon arrival, the two delegates were greeted by Assoc. Prof. Dr. Norazman Bin Abdul Majid, Director of QU English Language Department and other members of the Language Department. The main aim of this visit was to conduct Intensive English Program – Transnational Education (IEP-TNE) language assessment for the first batch of students from QU, the first UTM franchise campus abroad. The assessment encompasses two sections; Online Test and Oral Test. 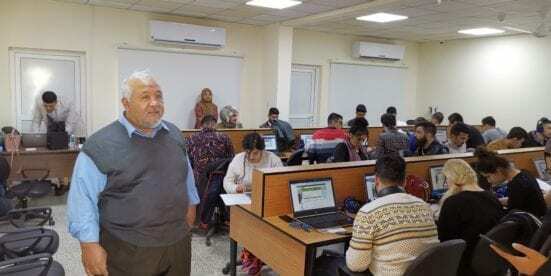 The online test was conducted in three QU computer labs where students’ reading, listening and grammar proficiency were assessed while students’ oral communication skills were tested through oral test. The oral test was conducted in groups and students were required to discuss issues related to students’ academic life. The evaluation criteria of the two tests were specifically designed to be aligned with the Common European Framework of Reference (CEFR). A total of 66 students were involved in the test. Students who obtained CEFR Level B2 or above will be able to join the faculty as soon as possible whereas those who achieved B1 and below will have to attend IEP courses designed in three modular cycles. The delegates were also invited to a dinner party held by the faculty members of QU language department as they celebrated the end of the students’ training session. Through the dinner party, delegates got to experience authentic Kurdish food, hospitality and culture. As Mr. Ghazali and Ms. Awis left Sulaymaniyah for Malaysia, four more lecturers from Malaysia arrived to teach at the university. This was followed by the visit of UTM Vice Chancellor delegates to the university from 11 to 13 February 2019. It is hoped that the collaboration between LA and QU will help make the transnational education program initiated by SPACE, a huge success not only for LA but also for UTM. Writers: Ghazali Bin Bunari and Awis Rumaisya Azizan.